Awesome! The bike even seems like it's from the 80s. This is my favorite wave 8 figure. firing their weapon in their right hand, eh? Near perfect scale pairing of him on the cycle – gotta get me one of those (Maisto, right?)! 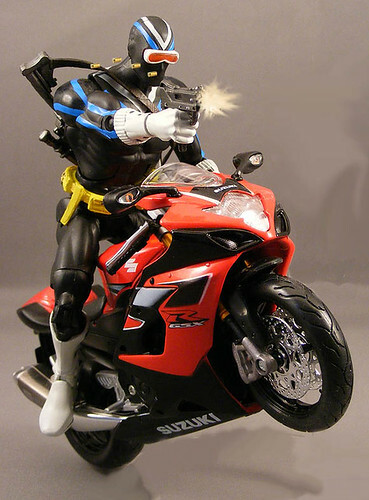 Actually, I can also imagine DCUC Wave 9 Deadshot on that bike as well! Hey I like the bullet casing effect. Where’d you get that from? will buy thisgreet actionfigersand buy the set, greetjobmattle. Yeah, nice work on the bullets Poe. I just grabbed a bullet casing image off Google, shrunk it and copied/pasted it. I really should have made them going all over the place (and not parallel), like my Duke Nukem photo. A bit of black and dark grey paint and we have Snake-Eyes. It's kind of funny that I just recently bought a scale motorcycle like that one for my G.I. Joes.